"Ever thought about knowing your own 'best before' date?" Dillon thought his life was pretty standard, excepting the whole 'seeing everyone's death in their eyes' thing (kind of morbid, imagine that). Then Govcentral went and took an interest in him for it. Four years later and he's on the run, returned to the corner of space called home and facing something more terrifying than any government: A Mercedes scorned. 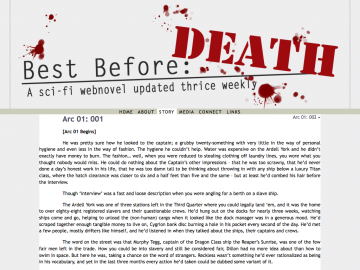 Best Before Death is an online novel that updates thrice weekly. No registration required. Best Before Death has not been tagged yet. Help others find Best Before Death by tagging it! Best Before Death has not been reviewed yet. Best Before Death has not been recommended yet.